"Son of man, set your face against Sidon; prophesy against her." The Crow is a pretty popular character in some circles. The fact that Brandon Lee while filming the titular character adds another level of gravitas to the property and plays into the mythos surrounding it. 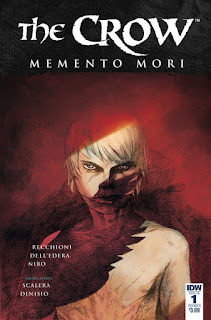 That's why The Crow: Memento Mori #1 from IDW Publishing has a lot of moodiness to work with. 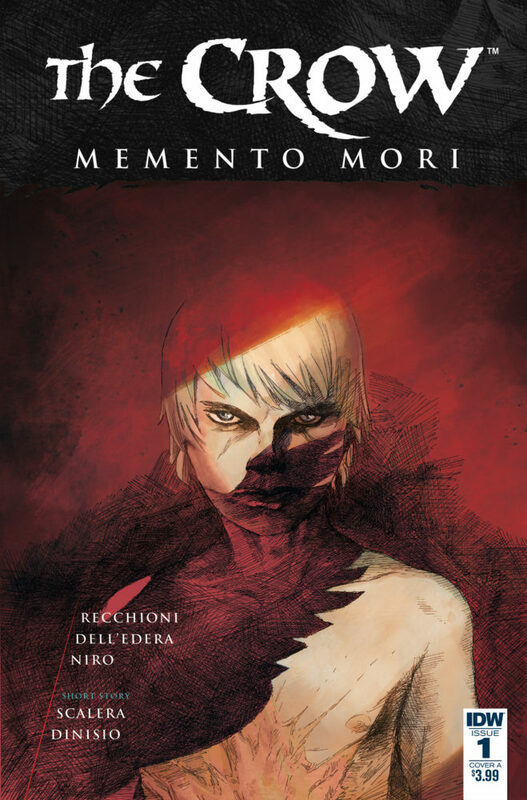 The issue is written by Roberto Recchioni, illustrated by Werther Dell'Edera, colored by Giovanna Niro and lettered by Giovanni Marinovich. "Buried Virtue" is written and illustrated by Matteo Scalera, colored by Moreno Dinisio and lettered by Marinovich. Follow David, the new Crow, through the streets of Rome, as he seeks holy vengeance against the terrorists that murdered him and his girlfriend. Rechhioni doesn't stray too far from the tried and true formula when it comes to Crow. David is the new crow and is hellbent on extracting justice for the crimes against him and his girlfriend which Recchioni elucidates through the use of Bible verses. Those verses lend themselves well to framing the story as Recchioni leans into them as a vehicle for David's vengeance. The issue is admittedly light on dialogue, but Recchioni doesn't need too much of it because the story itself is pretty self-explanatory. "Buried Virtue" is a lot shorter and leaner with Scalera really providing a broader backstory for the Crow in general. Dell'Edera's artwork is gorgeous. It's sufficiently dour in its presentation, relying on a relatively minimalist style that allows the characters to feel as if they're the center of attention when facing one another. That statement seems like it short-sells Dell'Edera's backgrounds, but his work there is equally as beautiful, imbuing the city of Rome with an abundance of character. Niro's colors are equally as moody, washing the issue in dark blacks and blues save for the few red splatters of blood. Scalera's artwork in "Buried Virtue" is similar in style to Dell'Edera's in its approach, but Dinisio's colors are what really makes it pop. The Crow: Memento Mori #1 certainly isn't a fresh take on the character, but it still feels fresh in some way. David is every bit as savage as the Crows before him. Recchioni's script is great in its simplicity, drawing heavily on its religious inspirations to convey an equally religious story. The artwork by Dell-Edera is what steals the show here, setting an extremely gloomy and depressed atmosphere that really stands out. The Crow: Memento Mori #1 has a lot that can appeal to readers unfamiliar with the Crow and looking for a good revenge tale. The Crow: Memento Mori #1 is available now.